The compact car segment is one of the most competitive in the automotive industry. Every manufacturer has a model in play, trying to blend the right mix of practicality, comfort, affordability, and reliability. With the Corolla, Toyota has managed to find just the right mix. And thanks to new safety technology, the Corolla is undoubtedly one of the top picks for compact consumers in 2018. The 2018 Corolla comes in three trim levels: CE, SE, and LE. All come equipped with a 132 horsepower 1.8-litre four-cylinder engine that produces a 128 lb.-ft. of torque. A six-speed manual transmission is available in two trim levels, while an automatic (CVT) is optional on the rest. The 2018 Corolla starts at $16,790 and is $22,010 at the highest level when the SE is equipped with the CVT. The Corolla is designed to be user-friendly and simple. All models come equipped with a backup camera, automatic LED headlamps and Toyota Safety Sense. That means your affordable compact comes fully equipped with adaptive cruise control, lane departure alert with steering assist, and a pre-collision system with pedestrian detection, high-end features that typically cost thousands on other models. After that, every model but the CE comes with automatic climate control and heated seats. There is also a $4,690 XLE package that is new for 2018, adding features like a sunroof, GPS, a heated steering wheel, leather seating and an auto-dimming rearview mirror. The highest level SE comes with the all the creature comforts like a leather-wrapped steering wheel, paddle shifters, and a windshield de-icer. 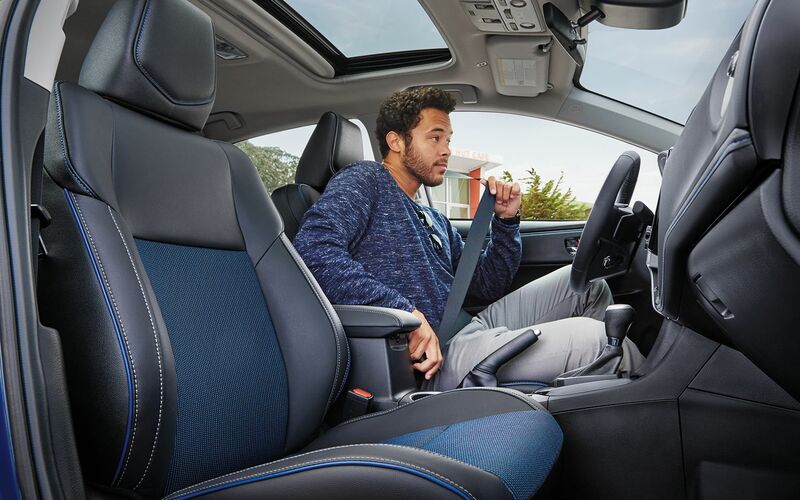 The Corolla offers an abundance of legroom up front. There’s also almost 41.4 inches of legroom in the back which is more than any other vehicle in the segment – and even some midsized compacts. The trunk is wide and there are plenty of storage options for small and large items. For parents, there are two sets of LATCH anchors located in the rear seats and with all that legroom available, they’ll find it easy to load in rear-facing car seats. Why is the 2018 Corolla the Best Compact Car? The 2018 Corolla houses a completely new exterior style and a fresh interior. Toyota has also added loads of safety technology giving you peace of mind in any situation. There is also an abundance of space and more high-end features than most competitors in the segment. Want to take a Corolla for a test drive? We have a multi-lingual, knowledgeable sales staff that can help explain new features and show you the ins-and-outs of the all-new Corolla. Book online today.